This is a photograph of the narrow gauge, bogie, railway goods van No. 4 built by the Clyde Engineering Pty Ltd in the Sydney suburb of Granville. It is seen fitted with a temporary lifting frame to enable handling by an overhead crane or derrick. 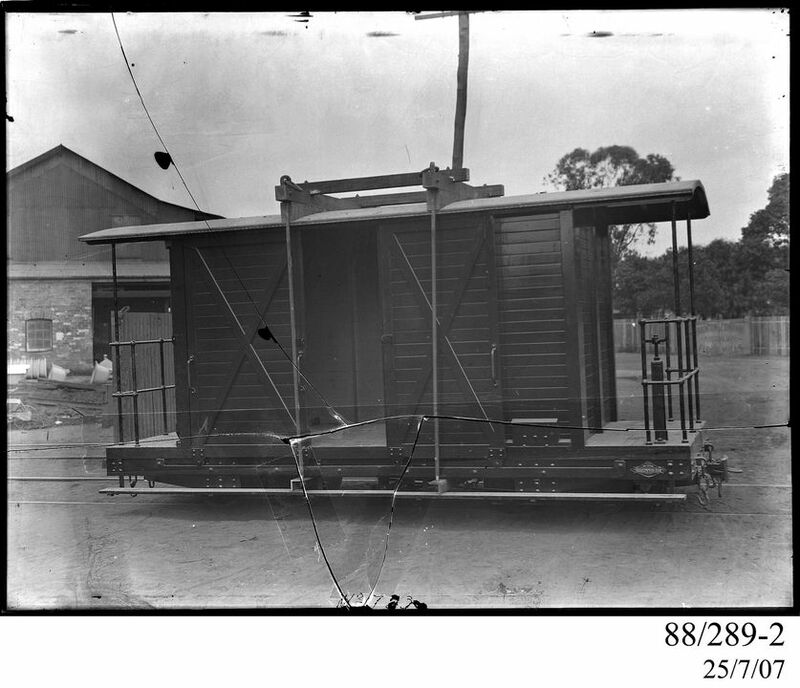 Black and white glass plate negative depicting a 2 ft (610 mm) narrow gauge goods van with an all-timber body and underframe, hook couplings and buffers. There were centrally located double doors on both sides and a platform with handrails on one end for the guard. The photograph shows the van in a set of railway tracks in an outdoor landscape with a large industrial building and trees in the background. There is text directly hand written directly on the negative stating "No 723". The Clyde Engineering Company photograph collection is made up of around 1300 ½ plate glass negatives and approximately 4000 triacetate negatives. The tri-acetate collection appears to date from the late 1930s through to 1960s the glass plates from around 1900 -1950. Most of the photographs are commissioned works taken around the Clyde Works in Granville, Sydney. Others are copies of original photographic prints, blueprints and pages from books. These are hard to accurately date it is almost certain that the collection is the work of numerous photographers; unfortunately their identity is at present unknown. Glass plates were first used to support photographic emulsions in the late 1840s and remained in continuous use right through until the middle of the twentieth century. While the earliest plates supported 'dry' and 'wet' collodion emulsions these were replaced with silver gelatin emulsions in the 1880s. Unlike earlier plates these were mass produced on a huge scale and were capable of fast speeds even at ½ and full plate sizes. Gernsheim, H. and Gernsheim A., The History of Photography from the Earliest Use of the Camera Obscura in the Eleventh Century up to 1914. London, New York: Oxford University Press, 1955. The Clyde Engineering Company photograph collection was acquired by the Powerhouse Museum in December 1987. The material was removed from Clyde Engineering when the offices were being relocated and appears to be only a portion of the original collection. Around 1350 ½ plate glass negatives and approximately 4000 tri-acetate negatives came to the Museum at this time. The tri-acetate collection is made up predominantly of copies of blueprints and plans of machinery dating from the late 1940s through to 1960s. These subjects may have referred to actual work carried out by Clyde but material appears to have also been used for research and copied directly from books. In 2007 the tri-acetate negatives were placed into cold storage while waiting to be catalogued. In the same year the glass plates were catalogued and digitised as a part of the Total Asset Management Project for the Museum's collection database and website and for Picture Australia. The subject matter contained in the ½ plate glass negatives covers over 60 years of the Clyde Engineering Company's activities in New South Wales. It starts in the 1880s when the company was still called Hudson Brothers and goes through to the late 1940s. Most of these images were taken at the Clyde Works in Granville, Sydney, New South Wales and many include interior and exterior images of the people and workshops at Clyde Engineering and on the banks of the Duck River. Some appear to have been commissioned to record the completion of particular Clyde projects such as locomotives, boilers and agricultural equipment at the Clyde works. A few have been photographed in other locations such as the aircraft photographs taken at Bankstown Airport and some works photographed after delivery. A few photographs are copies of original photographic prints, blueprints and pages from books and these are hard to accurately date. As most of the original negatives were taken over a long time period it is almost certain the photographs are the work of numerous photographers, unfortunately their identity is at present unknown. Some of the negatives have appeared in a Clyde booklet published for the delegates of the 'Seventh Congress of the Chamber of Commerce of the British Empire in 1909' and a Clyde booklet held by the museum which was published around 1945. These publications and the fact that some of the negatives have been masked make it clear that the while the photographers were cataloguing the accomplishments of the company they were also creating content used to advertise and promote the company's products. Two photographers who did photographic work for Clyde from the 1960s onwards were Charles French of 87 Yarram Street, Lidcombe in New South Wales and Jack Draper an employee and photographer employed by Clyde Engineering around the same period.